This website is the home of PIAA District 1 wrestling. Click on the links above for tons of information regarding high school wrestling in the district. The site is constantly updated with the latest scores and results, statistics, news, and rankings. Plus check out the forum and join in the latest discussions! It takes many people to help keep everything on this site updated and current. However, we are always looking for more people to help and contribute. If the information (schedule, roster, results, etc) for your team isn't up-to-date, then chances are we don't have someone from your program contributing information. Anyone can signup to contribute...a coach, a parent, a fan...any adult. If your program doesn't have someone contributing, sign up is free and simple. Just click here to sign up for access to your program's section of the site. Starting on Sunday, April 14th, we will be unveiling our picks for the District 1 Wrestling All Decade Team. Anyone in the graduating classes of 2010 to 2019 was eligible. A panel of over 40 coaches, referees, and wrestling media voted to pick the best of the best. We will have a First Team, Second Team, Third Team plus some honorable mentions. The list will be released 2 weights per day starting on Sunday and concluding on Saturday, April 20th with the final weights plus the Wrestler of the Decade as well! Be sure to check back for this special list. The 2018-19 season is in the book! District 1's AAA post-season had a new look this year for four section tournaments and then the regional, while AA remained the same with the District tournament shared with D12 and then the regional. We have all the brackets and results for all the tournaments around the state, including here in District 1. Check out the links below. District 1 brought home two state titles, both at 152 pounds. Pope John Paul II's Ryan Vulakh (AA) and Owen J. Roberts' Daniel Mancini (AAA) each captured gold. Vulakh also was named the AA tournament OW as well. D1 finished with 20 medals in AAA and 3 more in AA. Congrats to all! 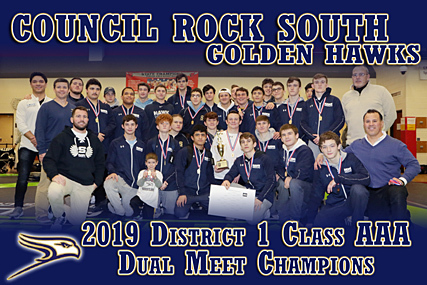 For the second year in a row at the District 1 AAA Duals, Council Rock South and Spring-Ford faced off in the championship match. And just like last season, the top seeded Golden Hawks came out victorious to claim their third straight championship (and fifth overall, tying them for the most D1 AAA Duals titles with Upper Perk). The final score was 42-25, which was a bit closer than when the two teams met in mid-January. In the third place match, Owen J. Roberts defeated league rival Boyertown 41-26, giving the PAC three of the four teams District 1 sends to the state duals in AAA. The AA final was also a repeat of last season, with Faith Christian Academy defeating District 12's Bishop McDevitt 51-22 to win their second straight title. The two teams have now faced each other for the championship in three straight years. With Owen J. Roberts and Boyertown both winning their opening round state duals matches, all five teams will participate in the rest of the State Duals starting Thursday at the Giant Center in Hershey. Congrats to Council Rock South and Faith Christian on their championships! On Tuesday, December 11th we live streamed our 2nd annual District 1 Season Preview Show on our YouTube channel. Joe Youngblood and Glenn Kaiser previewed the new season from all angles (top teams, top freshmen, top returners, post-season talk, rankings, etc). We'll also had interviews from a bunch of coaches and wrestlers as well to get their perspectives on many items too. If you missed the live stream or just want to watch again, click the link below for the entire show. We've compiled the list of all returning wrestlers who participated in the 2017-18 post-season. You can view the list (including post-season tournament placing and season record) by clicking the link below. A printable version is available too via a PDF. Now that the 2018 wrestling post-season in District 1 is in the rear-view mirror, time to start looking ahead. The 2019 post-season is going to look quite different. In the fall of 2017, District 1 approved a recommendation from the District 1 Wrestling Steering Committee to change the AAA post-season from three weekends to two. The move will create four AAA sections where each qualify four per weight to form a 16-man South East AAA Regional bracket. Click the link below for all the details including the sectional breakdown of teams. Every year you can find many former District 1 wrestlers on rosters at every collegiate level. The 2018-19 season is no exception. We've compiled a list of all the former D1 wrestlers who are competing in college this season (only those on official school rosters are listed). Check out the link below! Contact us if we are missing anyone. Three years ago, PA-Wrestling.com started a new service to record video of regular season dual meets within District 1. We hope this service will help enhance the fan experience as well as create additional exposure for District 1 wrestling around the state and beyond. It's back for season #4! We plan to present a "Match of the Week" each week of the regular season. Some weeks might have a second match as well. All matches will be recorded and posted to our YouTube channel the day after the match. Subscribe to our channel and enable notifications so you are notified as soon as we post any videos. When available, we hope to live stream some matches as well. Any matches that are live streamed will also be archived for later viewing. 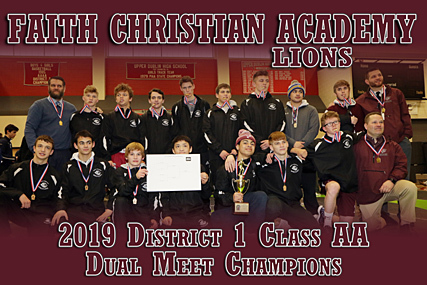 Every year the District 1 Coaches Association honors the wrestlers who are successful on the mat AND in the classroom with the All-Academic Wrestling Team. This year's team has over 80 wrestlers on it! Click the links below to see this year's team as well as teams from recent seasons. Congratulations to all those honored! During the summer of 2015 (after quite a lot of work), we have finally published a near-complete history of all District 1 post-season tournament results/brackets going back to 1974. There are a few tournaments that don't have complete results but the overwhelming majority of the section, district, and regional tournaments are complete. This project simply couldn't have been done without the work of Jack Holt, D1's wrestling historian! If you wrestled for a D1 team between 1974 and today...you HAVE to check it out. PA-Wrestling.com is finally on Twitter... Follow @PA_wrestling as we'll be posting final scores from around District 1 as well as links to the boxscores as soon as they are available on the site. Most posts will have the #PAD1wrestle hashtag as well. After the 2014 state tournament concluded, a panel of ten District 1 wrestling experts were asked to rank their top 25 D1 wrestlers over the past 25 years. Anyone who graduated from 1990 up to this year's senior class would be eligible for the list. We tallied all the votes to come up with our Top 25 list. Check out the link below for the list of contributors, wrestlers who received votes but not enough to crack the top 25, and the actual top 25 list.